The Hydra set 3 is a set of colour changing underwater lights that can be daisy-chained together for a fully synchronised display. 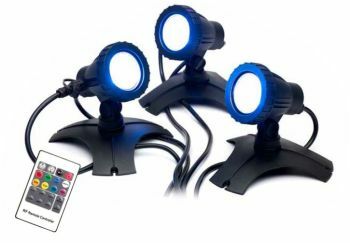 The RGB Spotlights are controlled from the remote handset and receiver, meaning whatever display is chosen will remain constant and synchronised across all three lights. The remote controller will operate up to 30m away and can also be used to toggle power to the lighting set. 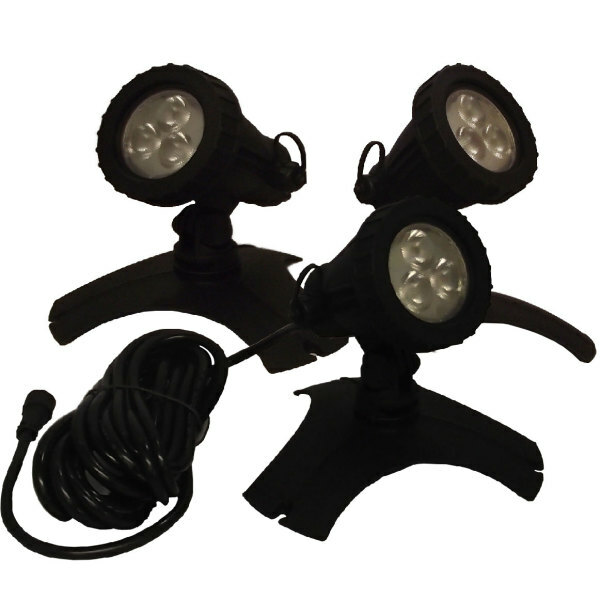 The mounting base and ground spike allow the lights to be placed easily inside or outside of water. The supplied components allow for the furthest light to sit around 15.5m from the socket or power terminal. The Hydra has a 50w equivalent light output yet consumes only 4.2 watts per spotlight, giving them excellent illumination through varying depths of water. Combined with their external receiver and long range, this makes them highly practical for use in ponds and water features. Comes with a 12 month warranty. 2.9m of cable with each light.